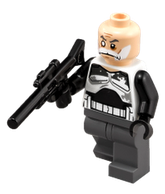 Commander Wolffe is a Star Wars: The Clone Wars minifigure that was released in 2011. 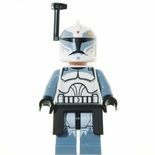 He is based upon the clone trooper commander of the same nickname in the Star Wars Universe. Wolffe with his helmet and armour removed. Commander Wolffe is composed of three main parts, plus additional parts for accessories. Unlike most Clone Trooper minifigures, Wolffe's leg piece is sand blue, with white and black printing on the front of the legs for detailing. Wolffe's torso is primarily white with the standard Clone Trooper armour design printed on the front and back. However some sand blue printing is added to the top of the piece on both the front and the back to better represent Wolffe's armour. 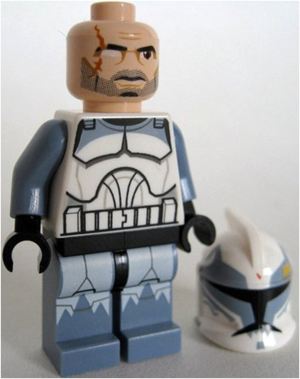 Wolffe's head piece is one of two non-standard Clone Trooper heads, the other being Captain Rex. Wolffe's left eye, mouth and some detailing on the face remain the same as the standard trooper face, though his right eye is entirely white, due to Wolffe having a cybernetic eye in the Star Wars universe. Other details added to the face include a scar running along the right side of Wolffe's face and a five o'clock shadow. Wolffe's helmet has the standard Clone Trooper helmet printing, plus sand blue printing in the shape of a wolf's head around the visor, a red triangle just above the visor, and three yellow stripes to the right of the triangle. Wolffe also comes equipped with a black kama, black rangefinder which is attached to the helmet, and two black commando pistols. CC-3636, nicknamed "Wolffe" was a Clone Commander who served under Jedi General Plo Koon during the Clone Wars. Wolffe commanded a squad in the 104th Battalion known as the Wolfpack. He lost his eye to Asajj Ventress at the Battle of Khorm, and was forced to wear a cybernetic replacement. Wolffe was involved in several missions throughout the Clone Wars, including the rescue of Generals Mace Windu and Anakin Skywalker on Vanqor. His armour was originally painted with a maroon design, but after the Battle of Abregado where several members of the Wolfpack died, he changed his armour to a dark blue to honour the fallen members of his group. This page was last edited on 6 October 2016, at 22:59.